Property Size 480 sq. ft. Spacious and affordable Studio with a private bedroom featuring Queen bed & flat screen TV/DVD, full bath, balcony. Fully applianced and utensiled kitchen with table and chairs. 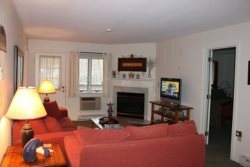 Living room area with sleeper sofa, gas fireplace, flat screen TV, DVD and A/C.